Heart Lake Conservation Area contains two kettle lakes which formed when the last ice age retreated. Around 20,000 years ago the Wisconsin Ice Age reached it’s maximum with an ice sheet that stretched from Newfoundland to British Columbia and south to Ohio and Illinois. In the Toronto area the ice was over 1 kilometer thick or about twice the height of the CN Tower. The advancing ice acted like a giant ice scoop clearing everything in it’s path. Melting glaciers it deposited this debris in many ways. Rivers of meltwater carried nearly straight lines known as eskers and the 7 kilometer long Brampton Esker runs south from Heart Lake. The debris the glacier contained was left behind in the form of outwash. Sometimes larger chunks of the iceberg would calve away and get buried by the glacial till in the outwash. Later, when the ice melted it left behind a hole that would fill with water and be known as a kettle lake. Both Heart Lake and Teapot Lake were formed in this manner and they both take their names from their shapes. Island Lake near Orangeville is also a kettle lake but it takes it’s name from a former land owner. On the 1877 county atlas map below Teapot Lake is missing and Heart Lake isn’t drawn in it’s inverted heart shape. There are a few free parking places in Donnelley East Park near Sandalwood and Heart Lake Road. This is the northern trailhead for The Esker Lake Trail which runs south for 8 kilometers. Walking under Sandalwood Parkway the trail can be shared with more than just pedestrians and cyclists. This little painted turtle was using the underpass to avoid the traffic above. 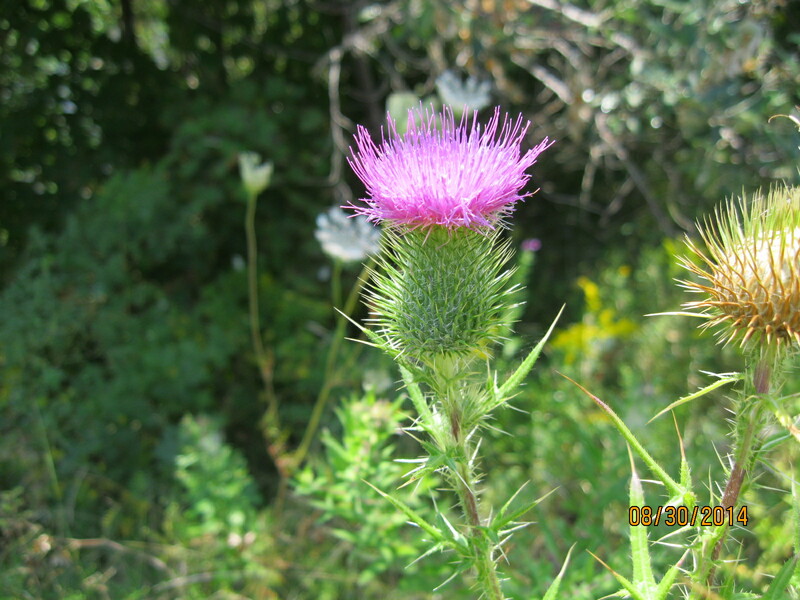 The Heart Lake Conservation Area is home to over 250 flora species and 86 fauna, some of them on the protected or endangered lists. The trail leads into the conservation area through sections of planted pine forests growing in straight rows. There are still large tracts of natural cover in the park making it the largest park in Brampton. Over 8 kilometers of trails are marked out in the park, some for mixed use and some just for hiking. Heart Lake was opened as a conservation area in 1957 with it’s kettle lake as a centre piece. Swimming and fishing are allowed on the lake and a splash pad has been added. Several thousand rainbow trout are stocked each year and the lake is also home to Largemouth Bass. Worms are the only live bait allowed in an effort to protect against invading species. More recently they have added tree top trekking and zip lining to the list of activities. The picture below shows the moment of truth for the zip line across the lake. The scent of lilacs fills the air for a few weeks each spring. They are a member of the olive family and are symbols of love in the language of flowers. Teapot Lake is another example of a kettle lake but this one was formed by a long thin chunk of ice. The lake is very deep compared to the surface area and so this is a meromictic lake. Most lakes have the water stirred up once or twice per year when the water temperature at the surface cools down and the water becomes denser than the water at the bottom of the lake. This keeps the water at the bottom oxygenated and allows for plant and marine life in the lower reaches of the lake. These ordinary lakes are known as holomictic. Teapot lake, at 12 meters, is deep enough that only the top layer mixes annually and the bottom layer remains undisturbed. The lake drops off in a series of steep terraces that may indicate previous water levels within the lake. While measuring water temperature and oxygen levels over an extended time period algae began to grow on the chain that held the sensor. No algae grew below 3.75 meters deep and the lake is dead below this level. The official plan for the lake is to not allow public usage so that it remains undisturbed. Wetlands and environmentally sensitive areas surround the lake and all formal trails have been routed well away from it. The lake is surrounded by a ring of trees that helps to shelter it and keep it’s record of the past intact. Meromictic lakes slowly fill up with sediment and eventually disappear. Teapot Lake has been collecting silt for a few thousand years and there are several meters in the bottom. 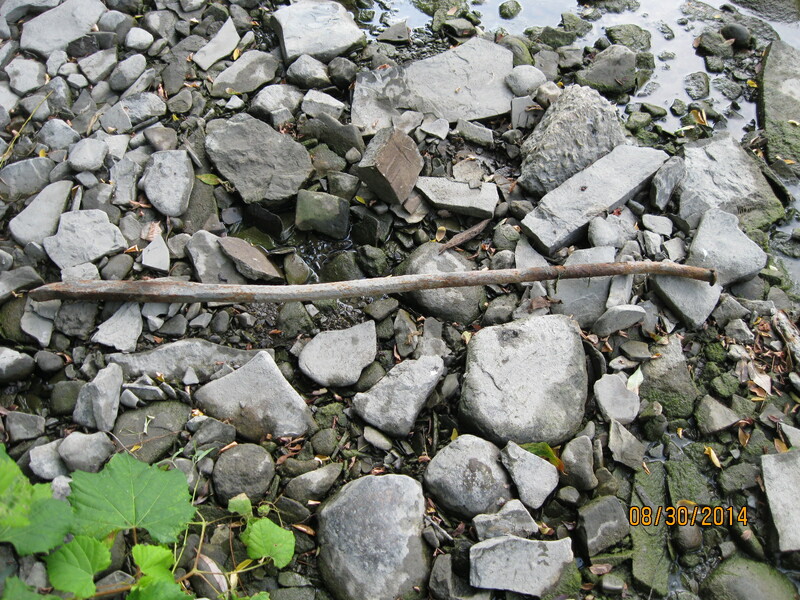 Core samples were taken to look for clues that might reveal the local history around the lake. The lowest layers of silt, those deeper than about 4 meters, contain a lot of eastern hemlock and spruce pollen. At a point roughly 5,400 years ago there is a sudden loss of all of this pollen from the sediment. It is then replaced with beech pollen which is interesting because beech trees are a species that is early in the succession of reforestation. This time period coincides with the hypsithermal period of global warming and may suggest that an insect outbreak destroyed the forest cover. Emerald Ash Borer insects are currently visiting a similar destruction by killing 99.9 % of all the ash trees in the GTA. For the period 500 to 1500 AD there is an increase in fine carbon in the sediment. This can sometimes mean the presence of a community but there were no other indicators such as the presence of corn pollen. Corn pollen had led to the discovery of a village of longhouses at Crawford Lake. Several swamps provide wetland habitat but for some reason were empty of herons. Canada Anemone grows in moist meadows and spreads quickly through underground rhizomes. A rhizome is a stock or stem of a plant that can send out new roots and shoots from little nodes along it. Canada Anemone was used by the native peoples as an astringent and to sterilize wounds. There is a lot to be explored at Heart Lake Conservation Area but Hiking the GTA is in no way suggesting that you should attempt to go to Teapot Lake. The picture in the story above and the cover photo are left to preserve the visual record of this little lake. A recent review of some popular hikes can be found here. This entry was posted in Etobicoke Creek, Uncategorized and tagged Canada Anemone, Heart Lake, kettle lake, meromictic lake, Teapot Lake on May 31, 2016 by hikingthegta. It was a bright sunny morning starting out at -17 without a wind chill. With only 3 weeks left until the first day of spring it is unusual for it to be so cold, but the sun had a nice warming effect on the skin. We parked on Sherway Drive, formerly known as Middle Road, where it now dead-ends at the 1909 Middle Road Bridge. In the 1880’s the property belonged to James Alderson who sold half an acre in 1864 for the construction of the Weslyan Methodist church. His daughter married into the Silverthorne family who were founders of near by Summerville. Today this area is known as Etobicoke Valley Park. The single lane bridge in the photo below at one time served as a main route between Toronto and Hamilton. 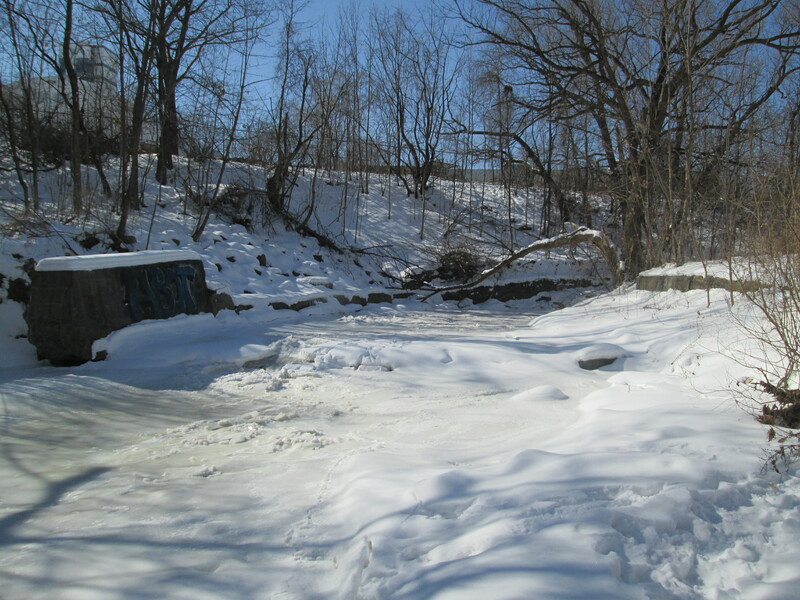 The Etobicoke Creek is frozen solid as it passes under the old bridge. Crossing the bridge we followed the old road for a short distance before returning to the west side of the creek and heading north. 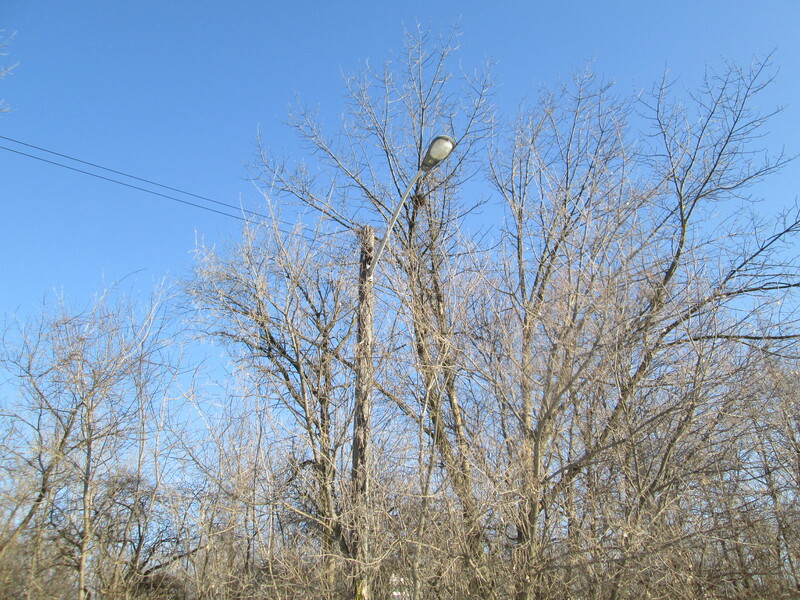 Middle road’s lamp posts are fading into the bushes along side of what was once a busy highway. 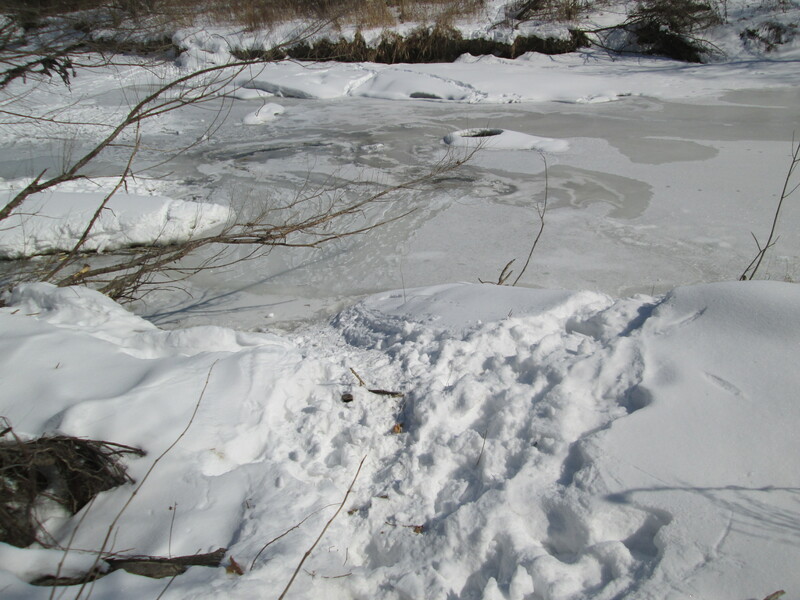 The Etobicoke Creek was frozen solid and many animals and humans had been passing over freely. As we walked up the west side of the creek we heard the yip and howl of coyote in what sounded like a multi-animal attack on some poor beast. Curiosity led us to back track and eventually cross the river to see if we could see what was happening. 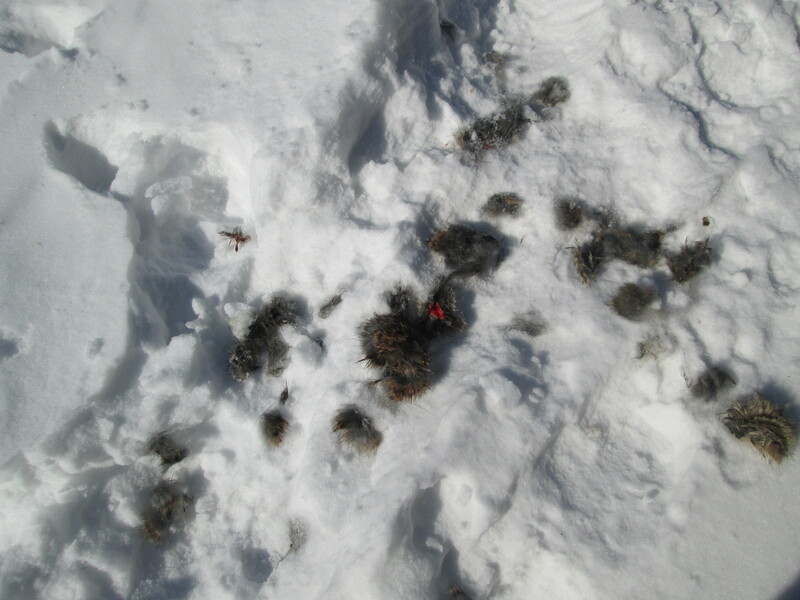 We came to a site that had a lot of snow trampled down, urine all over the place and spots of blood. 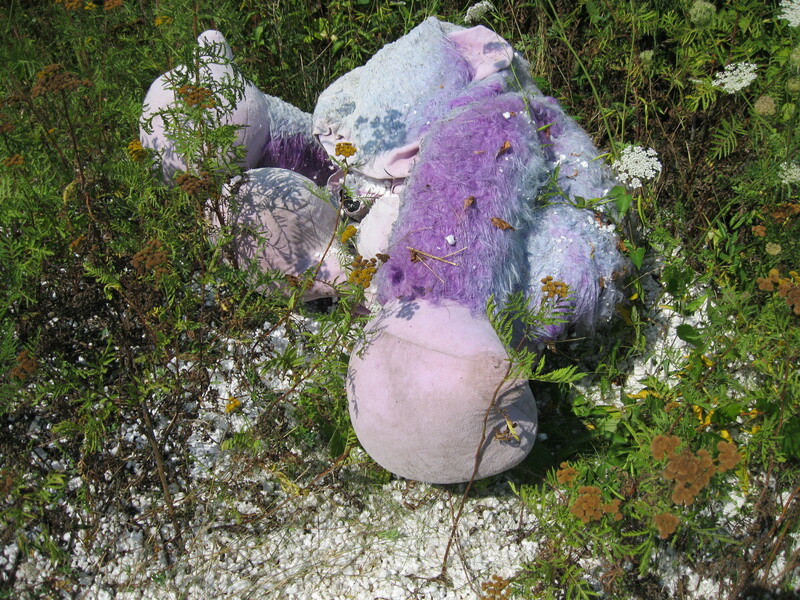 An area of fur chunks, some glistening with fresh blood, told a different tale. Female coyote come into heat for 10 days, only once per year. This season runs from the end of January until early March. Coyote are monogamous but if she isn’t in heat, she will fend of her partner with teeth and claws. With the cold weather running late this year the breading season may be a little late as well. It is likely that we had heard, and were now looking at the aftermath, of this seasonal encounter. Just north of the Queensway bridge the Little Etobocoke Creek joins the Etobicoke Creek. 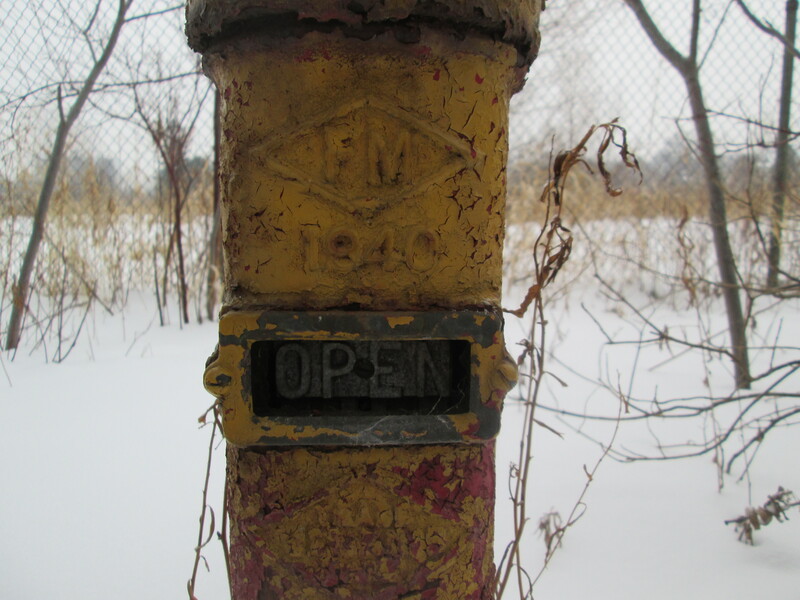 There are a lot of old metal objects along the valley of both creeks. Among them was this door from a 1978-1982 Chevy Corvette. We identified the year range and model from the part number on the tire inflation label on the end of the door. 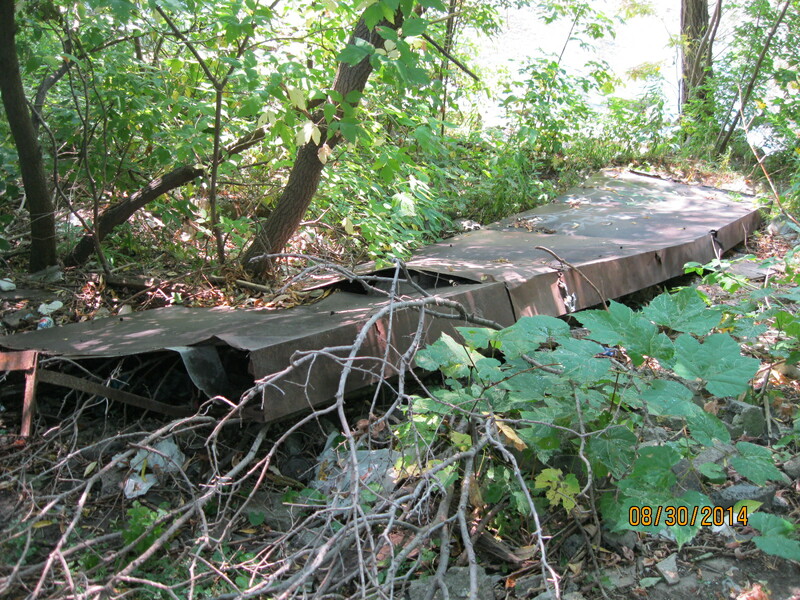 The foundations of an old bridge on Little Etobicoke creek may mark the site of what appears to be an old mill on the 1971 aerial photographs. Even though it wasn’t plugged in this 1958 RCA Custom freezer was working perfectly. Everything inside it was frozen solid. Retailing at $388, and still working after 57 years, it looks like it was quite a bargain. It was a pretty cool find on a cold day. 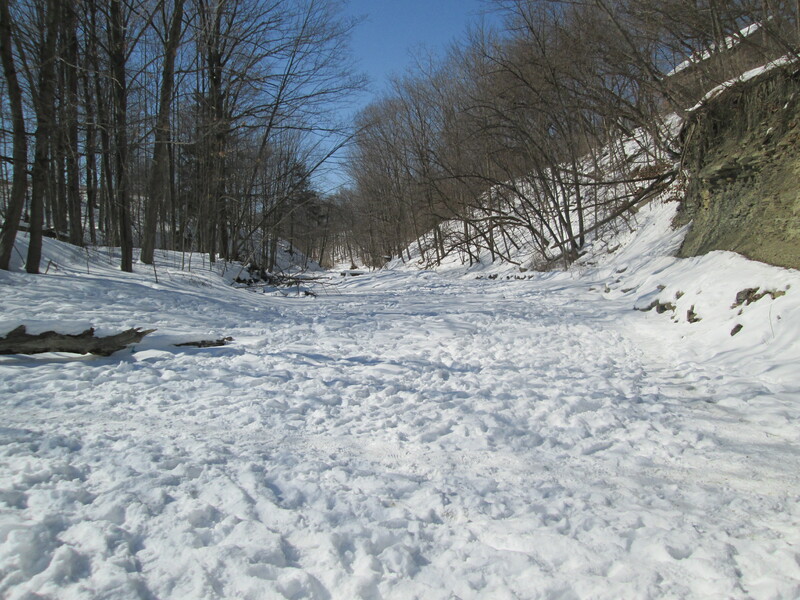 After hiking up Little Etobicoke Creek we returned to where it empties into the main flow of the Etobicoke Creek. The view below is taken from standing in the middle of Etobicoke Creek looking back up Little Etobicoke Creek. Just south of the Queensway bridge on our return trip we found this round hole in the ice. Based on the chewed up trees and the little trail of footprints leading down the embankment and across the ice we concluded that it is an access hole for a beaver family. When Europeans realized that North America was not the spice rich orient they set their sights on other natural resources. The beaver numbered up to 200 million and in the late 1600’s and early 1700’s the demand for fur top hats made beaver pelts a valuable resource. The Hudson’s Bay Company was founded in 1670 and incorporated four beavers on a crest for their logo. Under the crest was written “Pro Pelle Cutem” (Skin For Leather). During the peak of the fur trade 100,000 beaver pelts per year were being shipped to Europe. Much of the fighting in early Canadian history was over control of the fur trade. Fortunately, silk hats came into style just in time to prevent beaver from becoming extinct. 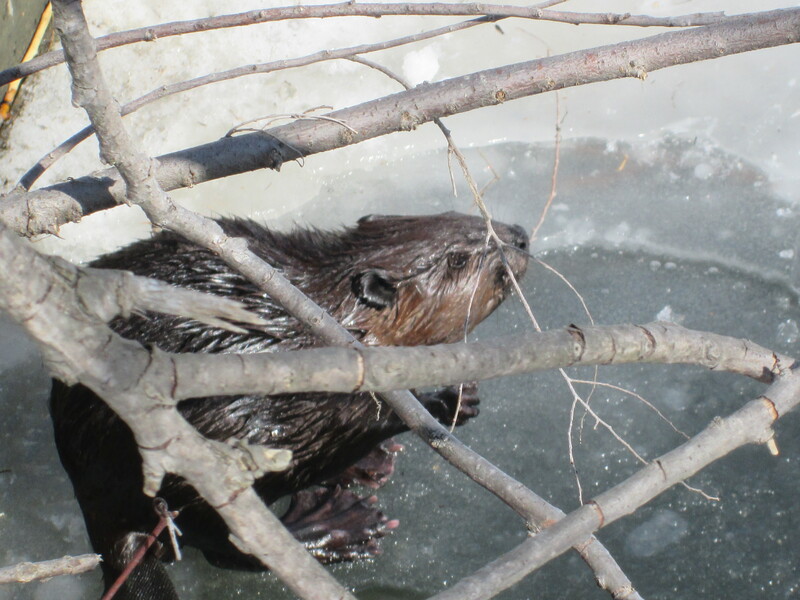 Just down stream we found a beaver near a storm drain entrance where the water was being kept ice free. In 1851 Sir Sandford Flemming was asked to create a design for Canada’s first postage stamp. He chose the beaver and the stamp has become known as the three pence beaver, as seen in the cover photo for today’s story. It was the first animal stamp issued anywhere in the world and today one in fine condition is worth $120,000. In 1937 when Canada was updating it’s coins the beaver was chosen for the 5 Cent coin. In 1975 the beaver was finally chosen as the official symbol of Canada. 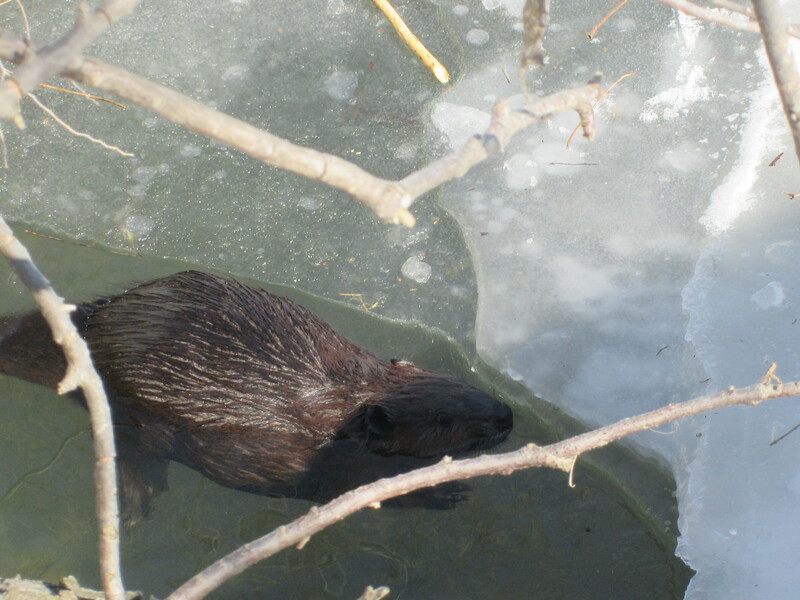 This beaver doesn’t seem to mind the cold water and perhaps that’s why their fur made such popular hats. 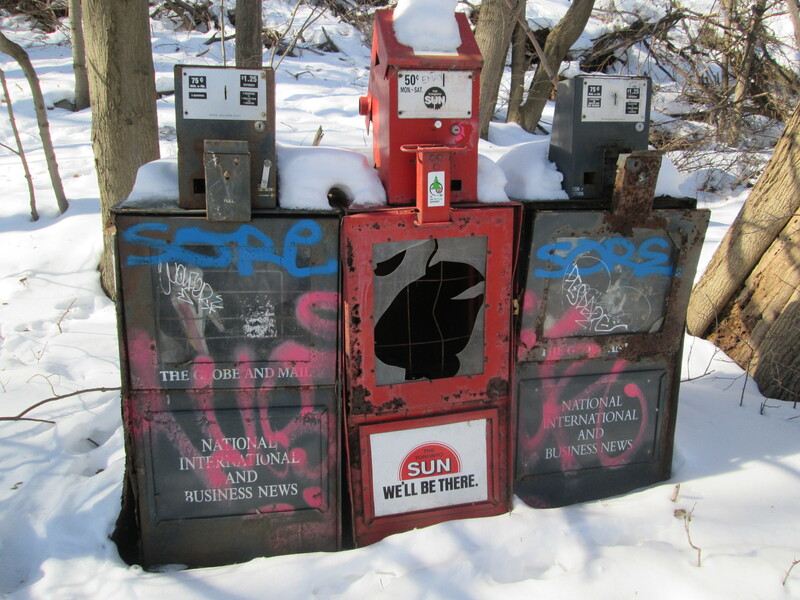 Along the trail heading back to the car someone has set up a number of stolen newspaper boxes. At the time the Sun box was stolen a daily newspaper would have cost you ten of those little coins with the beaver on them. Winter hiking often reveals places that show great promise for discoveries when the snow is gone. This is one of those places. 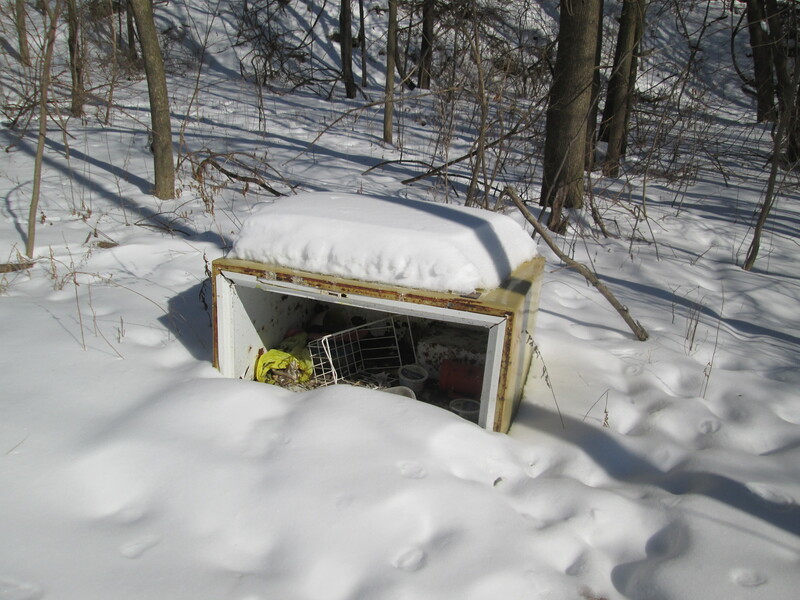 This entry was posted in Etobicoke Creek and tagged 1978 Chevy Corvette, beaver, coyote mating, RCA Freezer, three pence beaver on March 2, 2015 by hikingthegta. 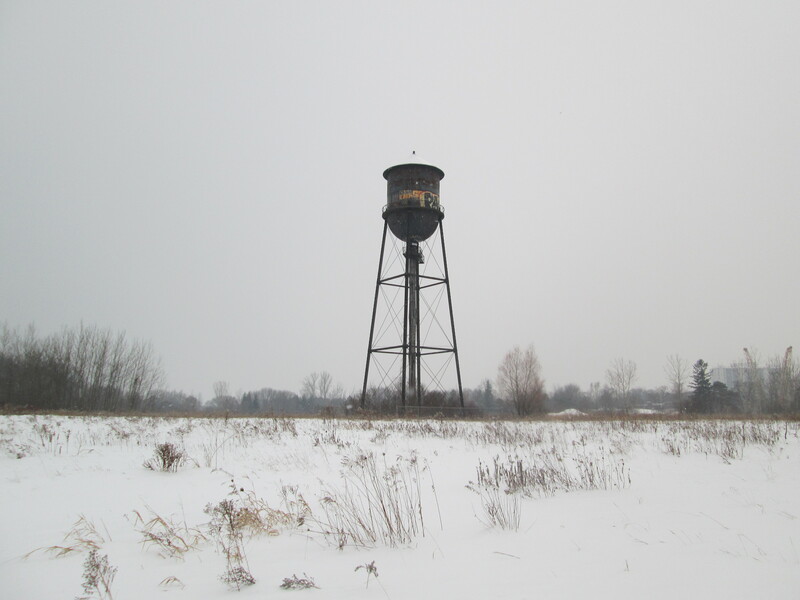 Along the Lakeshore stands an abandoned water tower, part of a WW2 small arms factory and rifle testing range. Today we are 49 days into winter with only 42 remaining which to me means its almost over. The forecasters are calling for up to 30 cm of snow over the next couple of days. Even so, this is the first hike of the winter where I’ve switched from hiking to winter boots. It was minus 4 with almost no wind chill and a steady light snow. I parked in the parking lot for Marie Curtis Park on the west side of the Etobicoke Creek. Col. Samuel Smith was granted lots 4-7 in 1806 and they remained in his family until they were sold to the Halliday’s in 1877. They were used for mixed farming for the next few years. Following confederation in 1867 the British Government wanted the new country of Canada to assume greater responsibility for its own defense. In 1868 the Ontario Rifle Association was formed for the training of militia. They used the garrison common at Fort York until 1891 but the increase in the use of the CNE grounds and the addition of a passenger wharf at the foot of Dufferin Street made firing rifles at the fort increasingly unsafe. 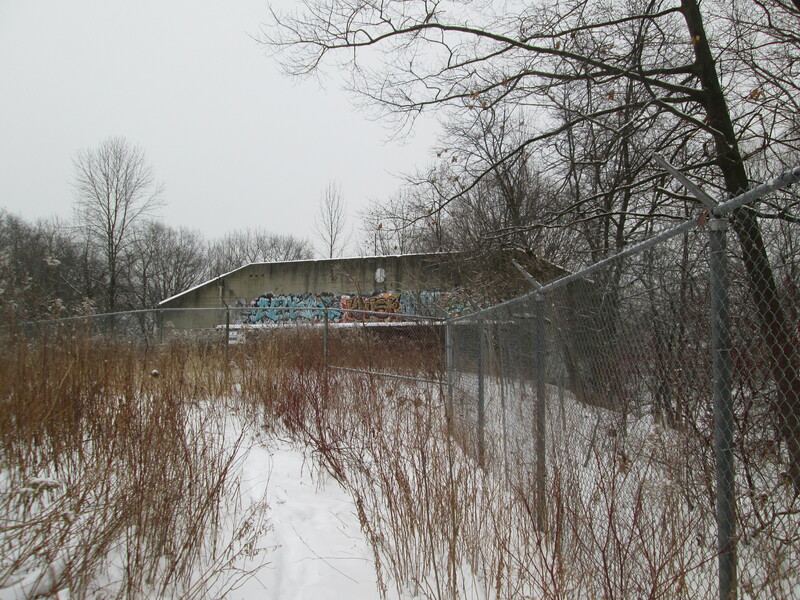 The property on the west side of Etobicoke Creek was purchased as the Long Branch Rifle Ranges. A militia and cadet training camp was maintained on the site until WWI when the Royal Air Force administration offices were located here. Canada’s first aerodrome was at Long Branch and over 130 students had graduated, at a cost of $400 each, by the time it closed in December 1916. William Faulkner, the famous author, was stationed here while training for the Royal Canadian Air Force. The most prominent structure remaining on the site today is the old water tower. It was built in 1941 to serve the needs of the industry on the site. In 1935 the Department of National Defense purchased the property with the idea of creating an arms manufacturing site. Small Arms Limited was founded as a crown corporation on August 7, 1940 to supply the Canadian Military with rifles for use in WWII. The 1957 picture below shows the factory and several out buildings. The large building with the lines on the top is shaped like an “L” with the black circle in the inner corner of the “L” being the water tower. 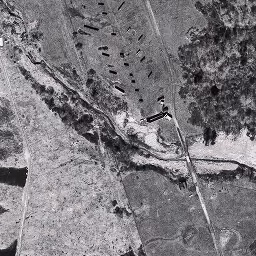 The rifle range building is in the lower left and the first several baffles can be seen below it. Women played a major role in the workforce at Small Arms Limited as can be seen in the cover photo making up most of the staff by 1943. The factory produced its first weapons in June 1941 and by the end of the year had made 7,589. By 1943 the plant was working three shifts, using 5,500 employees to produce over 30,000 units per month. World War Two ended in 1945 and war-time production was completed in December with over 900,000 rifles and 126,00 machine guns having been produced. 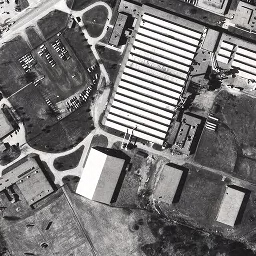 Various military parts were produced in the facility from then until it closed in 1974. 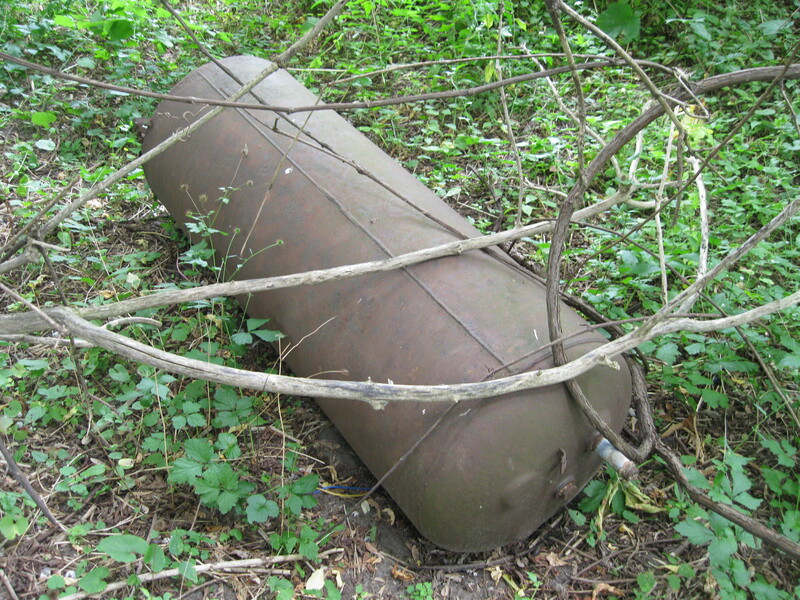 At the foot of the water tower stand two yellow gas regulators that were installed at the time the Small Arms company was founded. They are dated 1940. In 1910 Canada’s Department of Militia and Defense (renamed the Department of National Defense in 1922) acquired the property and built the wooden baffles that remain in place today. The DND built firing booths in 1940 to assist with the training of militiamen for service in WWII. The rows of baffles and concrete backstop can be seen in the centre of the 1957 aerial picture below. 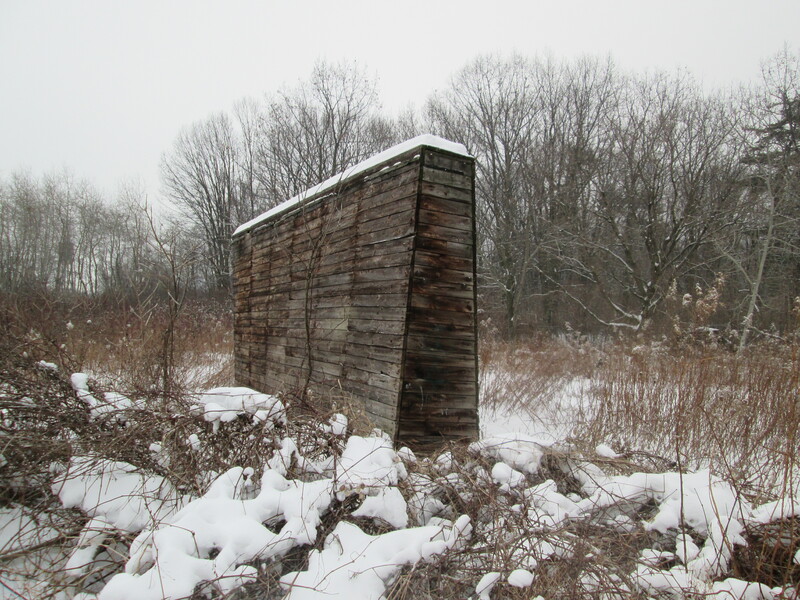 On the short rifle range there are 16 remaining baffles after 105 years exposed to the elements. Originally there were 30 of these which were hollow and filled with sand and soil. They were intended to stop any stray bullets from leaving the range but also served to provide sound barriers for the adjacent small arms factory. 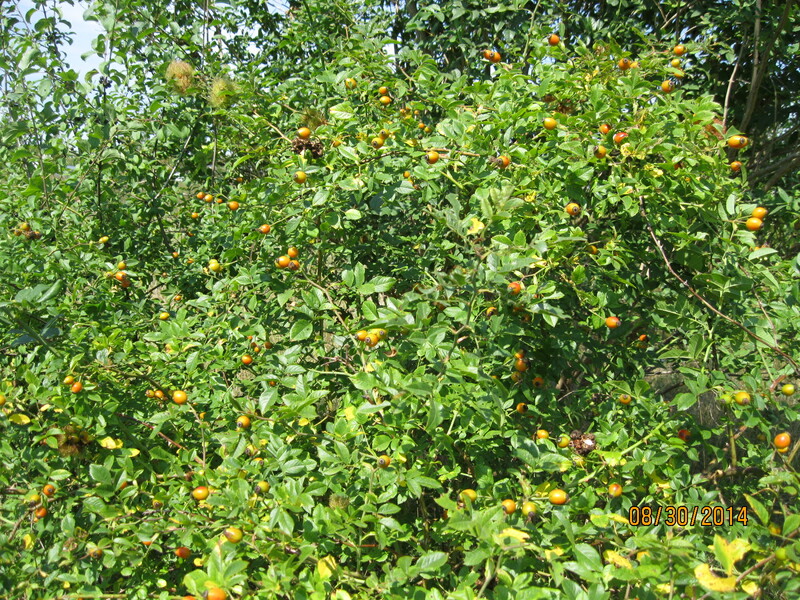 The picture below shows one of the few that is intact and not over grown with brush. 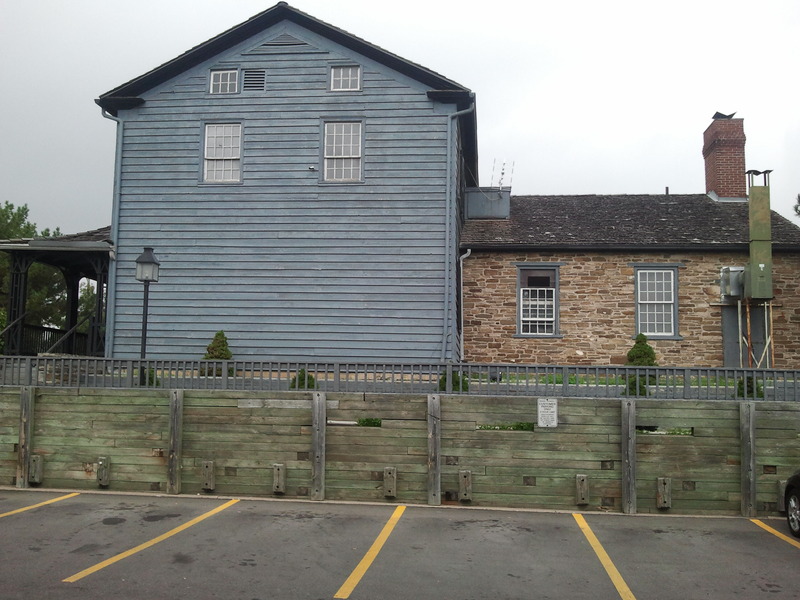 These wooden baffles are the last of their kind from this era in Ontario and are considered a militarily significant heritage site. At the back end of the rifle range is a fifteen foot high and thirty-five foot wide concrete backstop which was constructed around 1925. It’s surface is dotted with the impacts of hundreds of bullets from over the years. The only manufacturing building remaining on site is building number 12. Dating to 1939, it was used as the rifle inspection facility. It has a double fence, each with three strands of barbed wire surrounding it. I guess they don’t want you to go in there. The various uses of the site over the years has taken the farm land and left it with a mix of PBC’s, VOC’s, metals and radioactive waste. 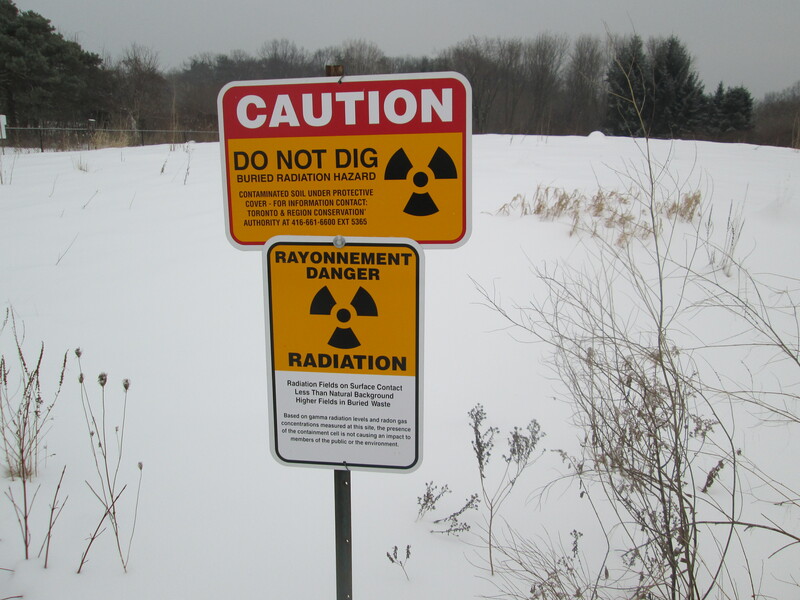 Over 72,000 tonnes of contaminated soil was removed from the site between 1998 and 2002. The consolidation mound pictured here contains low level radioactive soil that has been buried in a containment facility since 2005. It sits inside a third barbed wire fence behind the inspection building. I guess they really don’t want you to go in there. 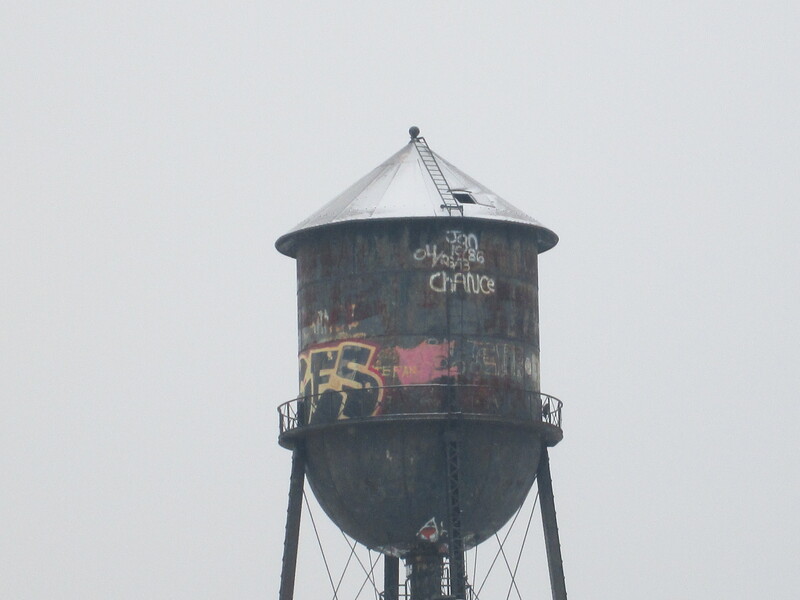 Circling back through the Small Arms Ltd property I noticed that someone left the door open at the top of the water tower. Anyone want to climb up that ladder on the roof and close it? Making my way across the Lakeshore Road edge of the arsenal lands I came to Etobicoke Creek. 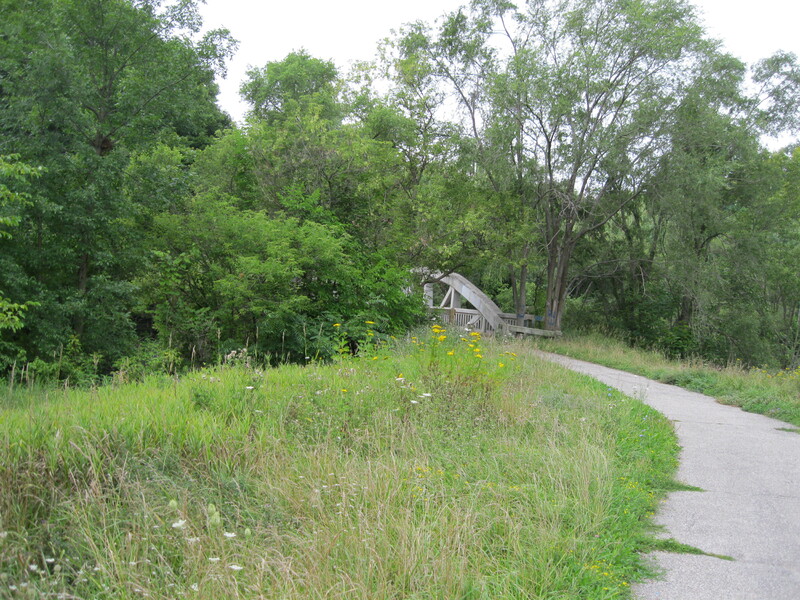 The trail along the creek’s edge brings you to a bridge that crosses the creek to the east side. 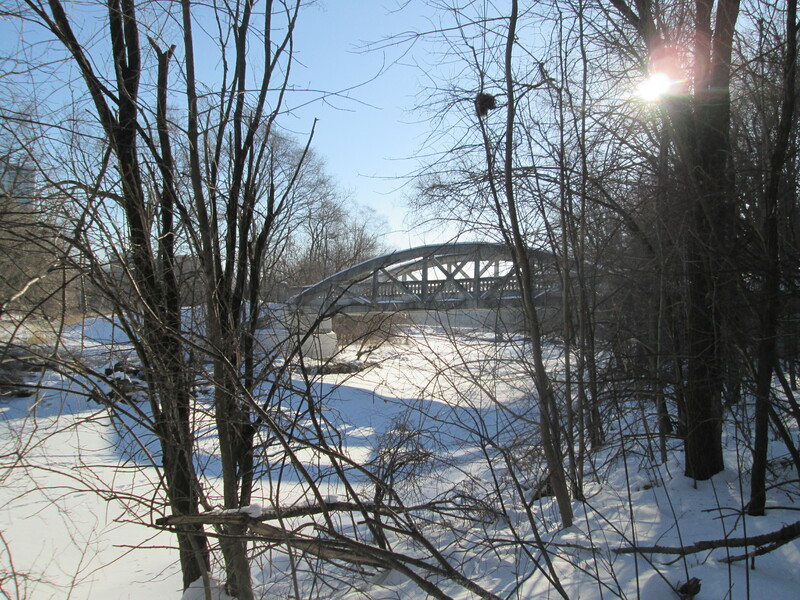 Following the disaster of Hurricane Hazel in 1954 when the creek flooded destroying the homes along 43rd street (see Middle Road Bridge) this area was taken under authority of the conservation authority and Marie Curtis Park was created. I walked that side of the creek to where it spills into the lake. 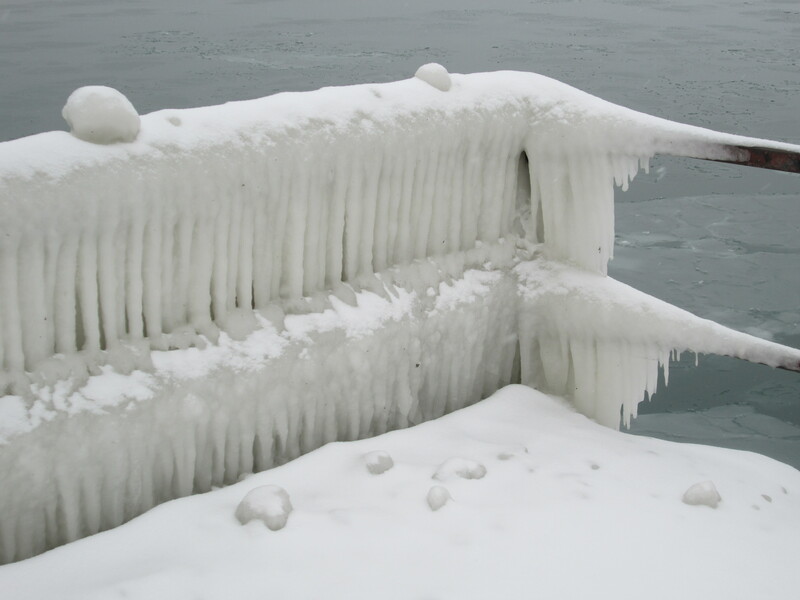 The ice on the railing at the edge of the lake is several inches thick and, to me, resembles baleen plates like those in the mouth of a baleen whale. Bufflehead ducks suddenly disappear when they are feeding and can pop back up several metres from where they dove. They are distinct with their white and black markings and spend the winter in sheltered bays and inlets. I watched a few of them right in the mouth of the creek. 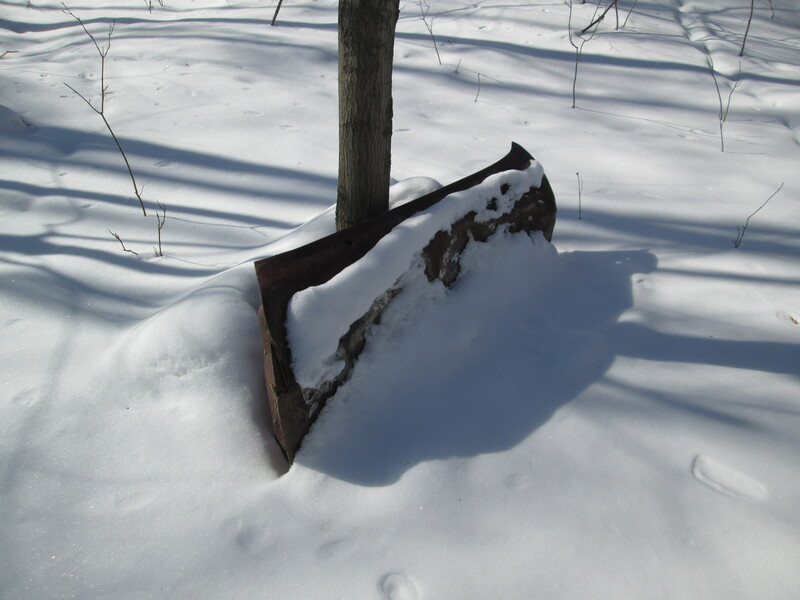 There are likely artifacts located here that will only be visible when the snow is melted. I guess we’ll have to see sometime. 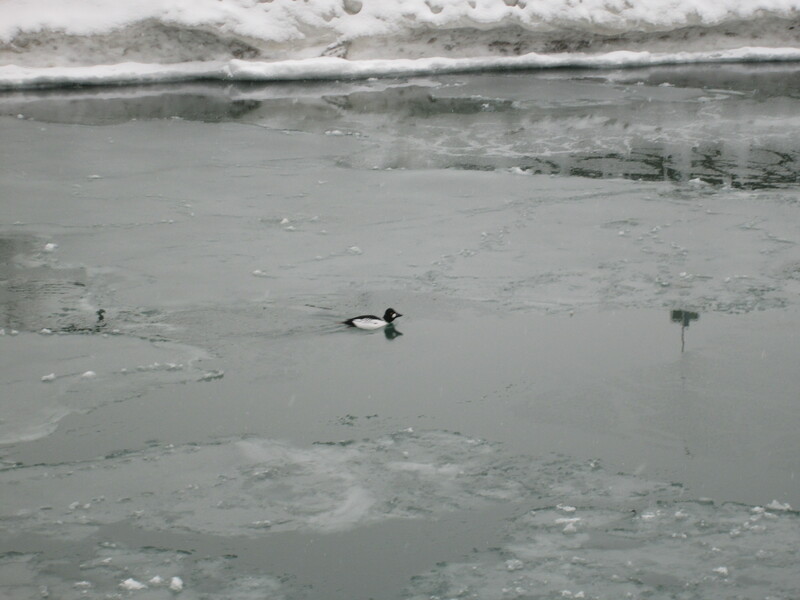 This entry was posted in Etobicoke Creek and tagged Arsenal Lands, Bufflehead duck, Etobicoke Creek, long branch rifle range, Marie Curtis Park, small arms ltd, Water tower on February 7, 2015 by hikingthegta. It was 15 degrees and perfect for a hike. We parked on 43rd street beside the Etobicoke creek. 43rd Street is only a short stub north of Lakeshore today. In 1954 it extended to the lake and, along with Island rd., contained houses on both sides of the creek near the lake. 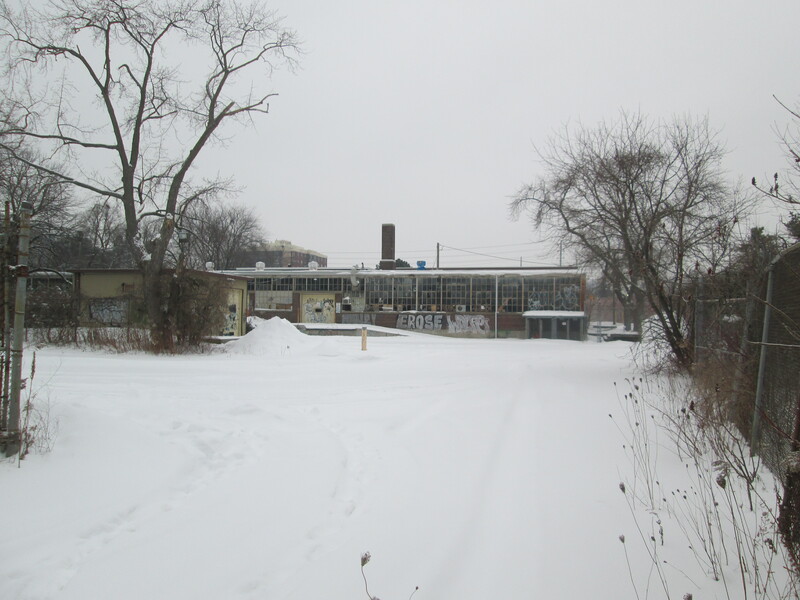 A trailer park existed at the time on the west bank of the river between Lakeshore Road and the railroad tracks. Seven people were killed and numerous houses washed into lake in October 1954 when hurricane Hazel hit Toronto. Visible from Lakeshore are a triple set of tracks, now used by GO Transit as well as many CN freight trains. When the Grand Trunk Railroad (GT) was built in the 1850’s it was two tracks wide. The bridge in the photo below was built in 1856. When the GT was incorporated into the Canadian National (CN) in 1923 a third track was added. In the photo below the older track is sitting on the large cut stone blocks while the newer addition on the left is constructed on poured concrete which had become popular around 1900. Coca Cola was invented in 1886 in Atlanta by a pharmacist, Dr. John Pemberton. Originally it was sold as a syrup that was mixed in the pharmacy and sold at the counter by the glass. in 1915 the distinctive “hobble-skirt” bottle was created. Selling for 5 cents it contained a 6 oz serving. Pepsi was created in 1893 and stole a share of the market by selling 12 oz bottles also for 5 cents. 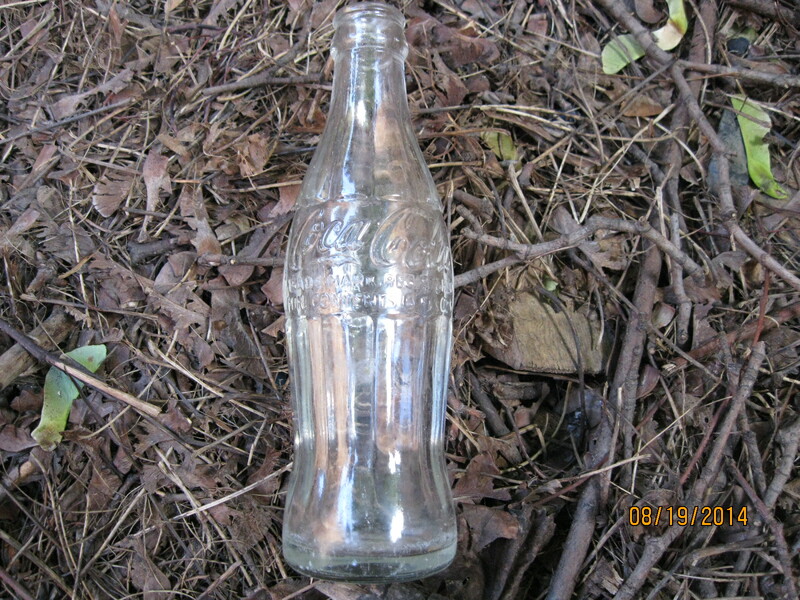 The coke bottle below was made in 1959. 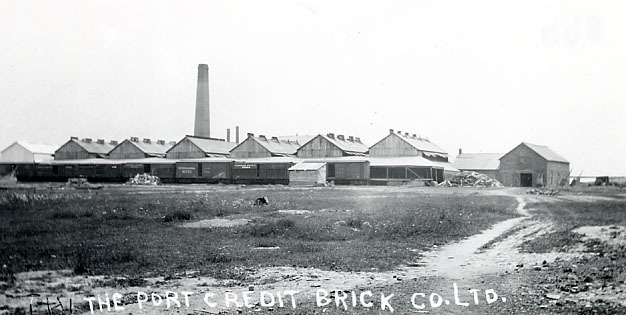 A brickyard was opened in Port Credit in 1891 on the west side of the Credit River. The business expanded and soon a scarcity of labour resulted in the use of immigrants to work in the brick yard. 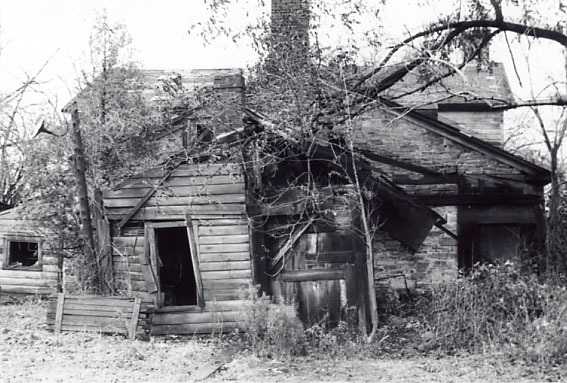 Bunk houses were built to provide homes for the workers. By the 1920’s the business was operating at a loss and it was closed down. 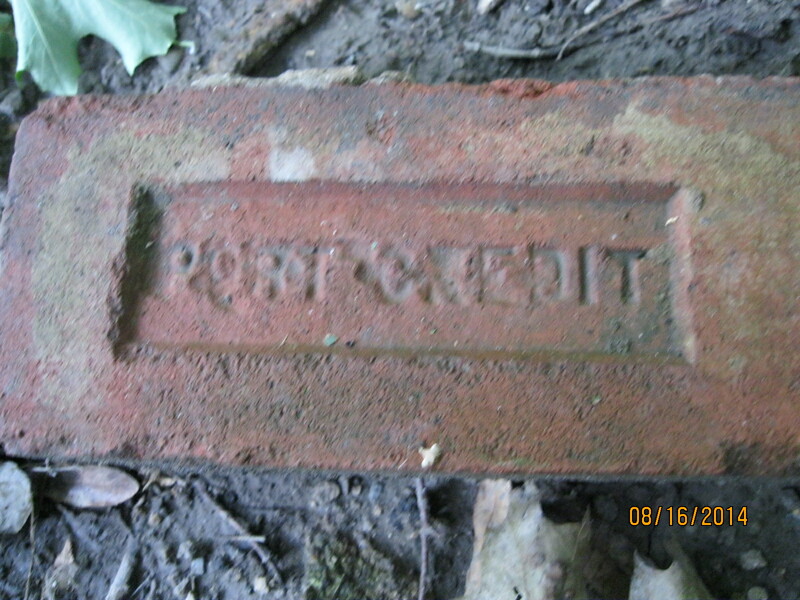 That means that the brick in the picture below is likely over 100 years old. The brick yards as they looked in 1907. 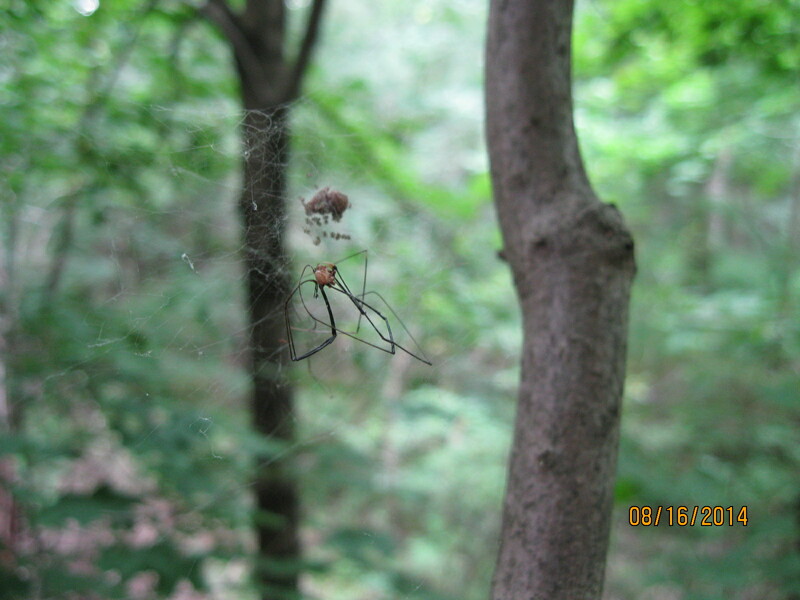 When hiking in the woods in August it is necessary to carry a small stick in front of your face to keep from eating spider webs. 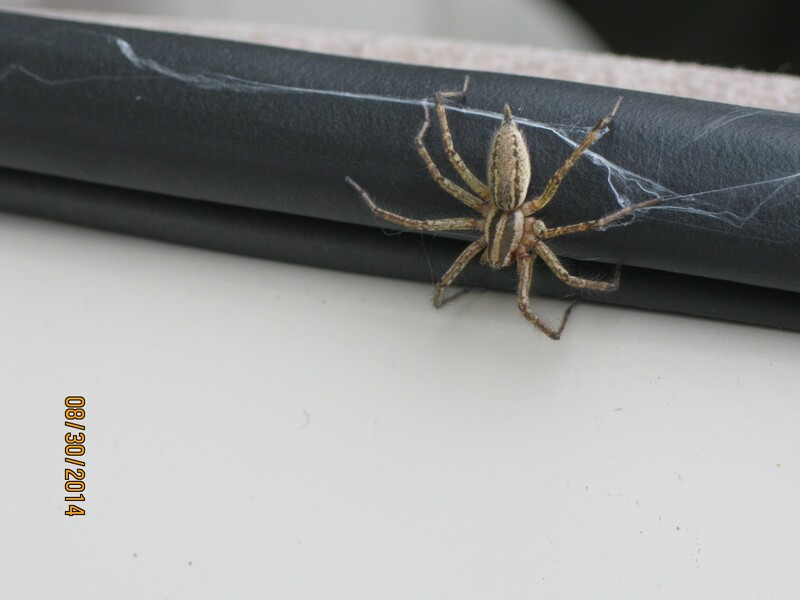 The Cross Orbweaver is one of the more common ones, although it is not native to North America. Females wrap their eggs in a protective sac of silk. There are between 100 and 800 eggs in a single egg sac. We found an egg sac that had just hatched. 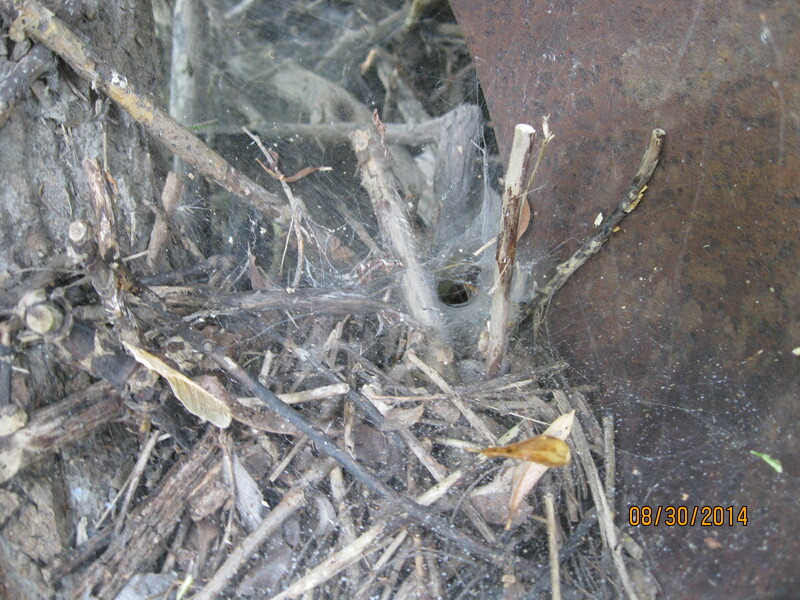 The picture below shows a “daddy-long-legs” spider which has been captured and left for food for the little babies. Note the tiny dots below the egg sac which are the emerging young. Just north of the tracks is the first old dam on the creek. 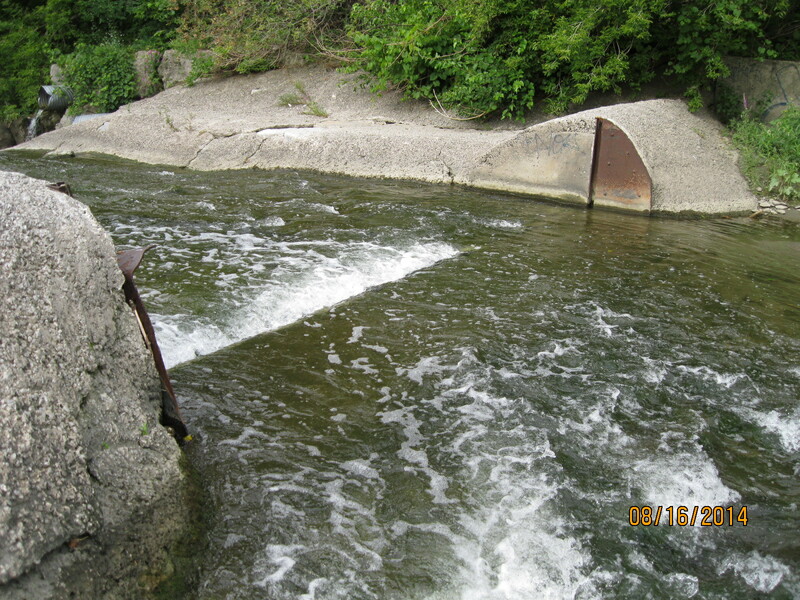 This dam has retaining walls which extend all the way to the edge of the ravine on both sides of the creek. This is a good example of an old dam as you can clearly see the slots in the river bottom to hold the boards that would retain the water for the mill pond. 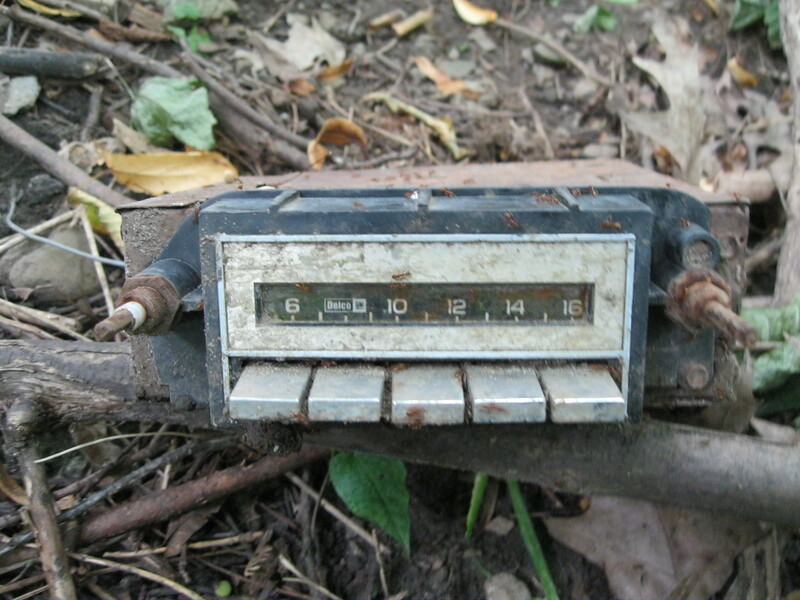 Delco radios are standard on GM products. In the 1960’s it was common to have only an AM radio in your new vehicle. FM radio, CD players and MP3 inputs were all many years in the future. We found an old AM radio with 5 preset channel function. Having 5 preset stations was a luxury at the time as you didn’t have to try to tune the dial while driving (let alone dial your cell phone). 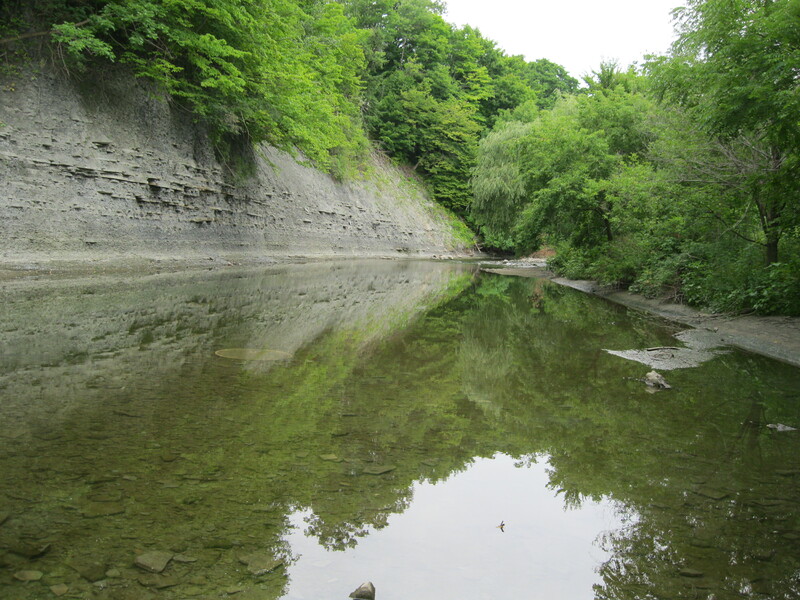 The Etobicoke creek was calm and clear. The west bank of the creek is a shale cliff which is slowly being eroded away from below. Shale is formed from fine particles of sand that is deposited in slow moving water. 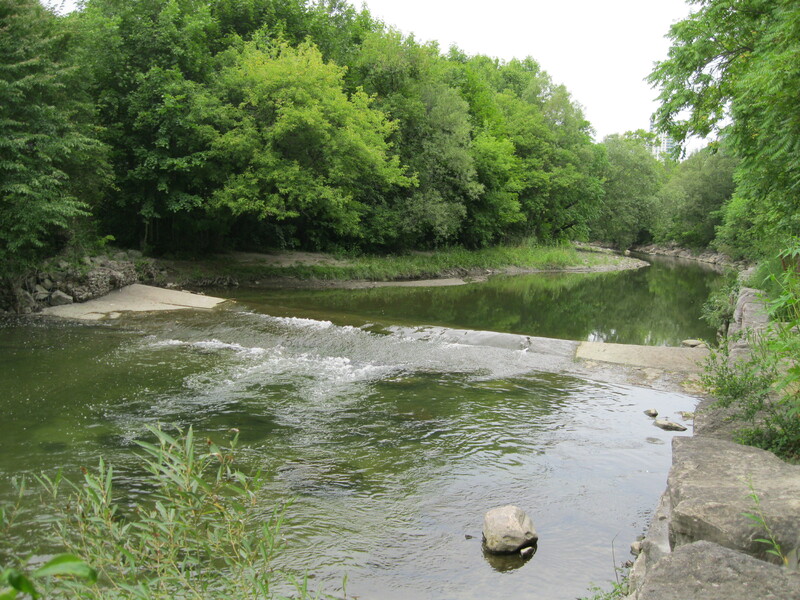 The second dam across the Etobicoke creek. Unfortunately, I haven’t found much information about the early miller families on the creek. Today was a day for hot water tanks. We found two of them along the way. One would wonder why someone would carry one of these out here to dispose of it. Most likely these are remnants of the mess left when Hurricane Hazel ripped homes apart and washed them away. Along the way we noticed that there was a white line on the pathway. Walking trails normally don’t have divider lines and so we suspected that this may have been used as a road at one time. 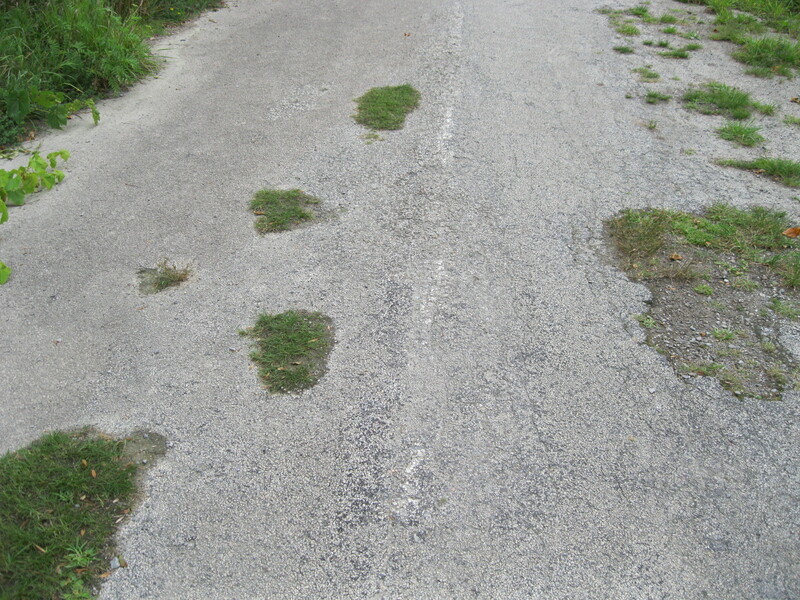 A few minutes later the roadway was lined with the remnants of a old parking lot on either side of the road. A couple of minutes later we saw the arch of an old bridge poking through the trees. It turns out that this is called Middle Road Bridge and it was built in 1909. It stands on the foundations of an older bridge. Originally designed to carry people and horses it quickly became too small in the days of the automobile as it was 1 lane only. It is the first example in Canada and only the second in North America of a reinforced concrete arch bridge. The Middle Road was a major connection between York and Peel counties. Middle Road got it’s name from the fact that it ran in the middle between Lakeshore Blvd and Dundas Street. Prior to the Queen Elizabeth Way being completed in the late 1930’s this was a major 4 lane road running as far as Hamilton. The portion of the old road which we had seen south of the bridge has been re-named Sherway Drive but it appears to be suffering from neglect as well. The bridge is protected by two historical societies. One end by Toronto and the other by Mississauga. 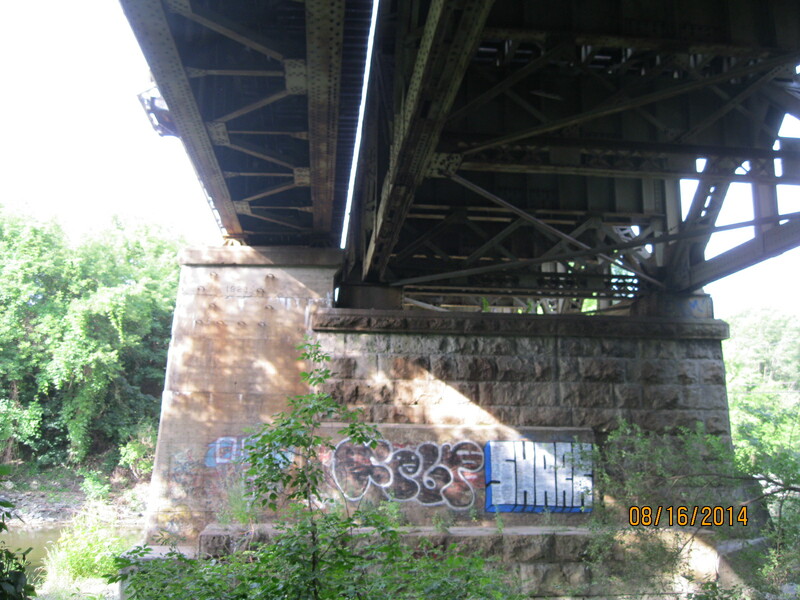 The cover photo shows the bridge from the western elevation. 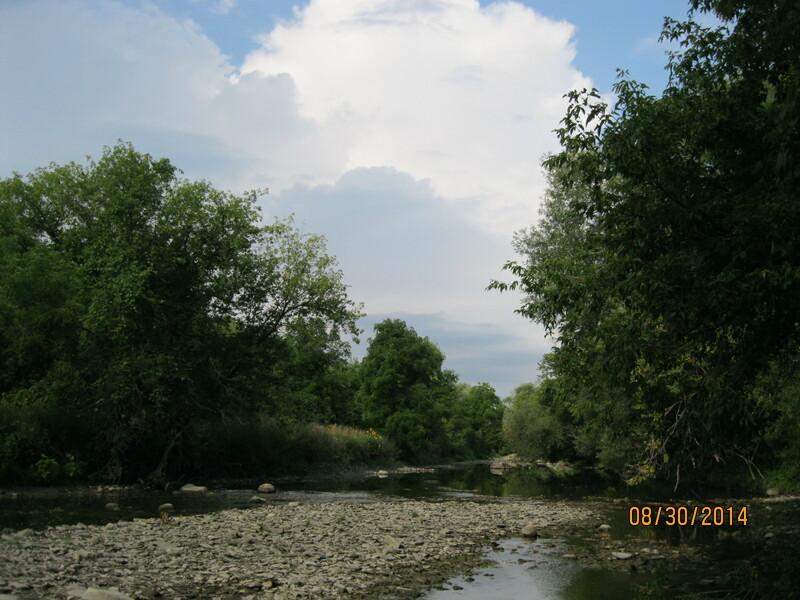 This entry was posted in Etobicoke Creek and tagged Etobicoke Creek, GTA, Hiking, Middle Road, Misissauga, Toronto on August 21, 2014 by hikingthegta.